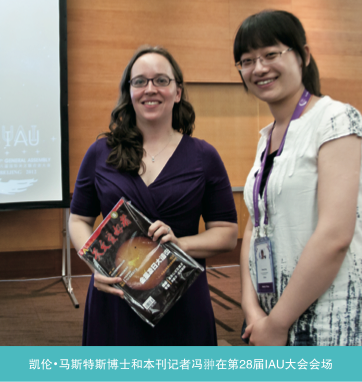 I’m back in the UK, so I thought it would be nice to give an update on the Chinese coverage of Galaxy Zoo resulting from the big talk I gave in Beijing at the 28th General Assembly of the International Astronomical Union. As you know, I was invited to give one of four “Invited Discourses” at that meeting, on the topic of “A Zoo of Galaxies”. The powerpoint slides of my talk are available online. I still don’t know where/if the video of the talk has appeared online, so will update more on that soon. As I mentioned before, an abstract of my talk (and a picture of me and one of my favourite galaxies) appeared on the front page of the first edition of “Inquiries of Heaven” (the IAU Daily Newspaper for the meeting). (PS. The image caption should say “Former winner of IAU Fellowship” since I won it in 2008, and there have been 4 more winners since me!). The talk also attracted a small amount of interest from Chinese press. 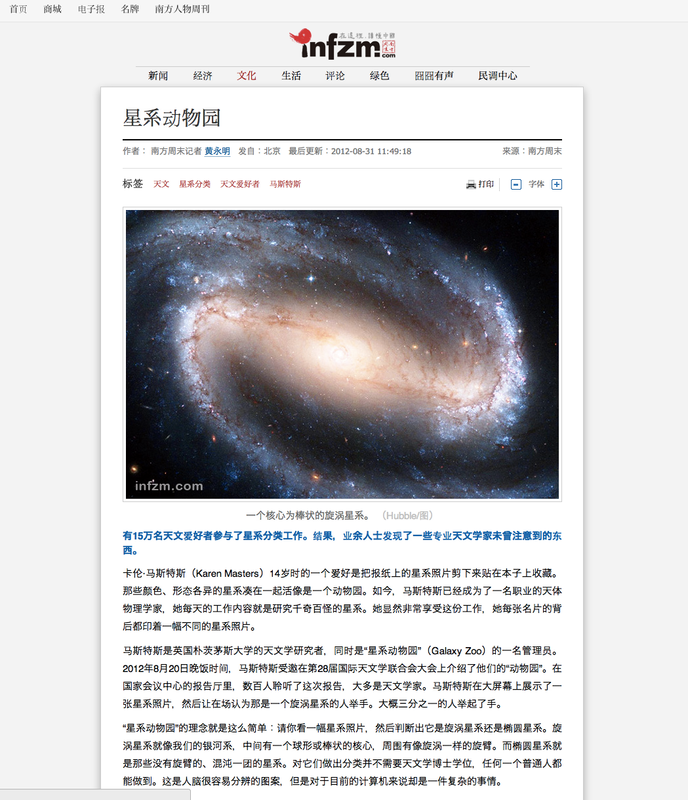 Kevin already posted the information that Xinhua (sort of the Chinese version of Reuters) covered it here: Astronomy Project Hunts for Chinese Helpers, (or the Chinese version); since this a news feed it got picked up by a variety of Chinese newspapers. 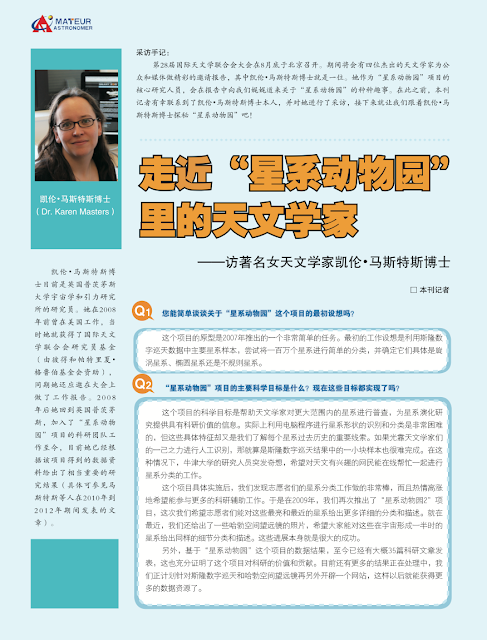 I was also interviewed for “Amateur Astronomer” (a Chinese astronomy magazine). Here’s the first page of the article they sent me. And a photo they took of me right after giving my talk when they gave me the previous edition of the magazine. 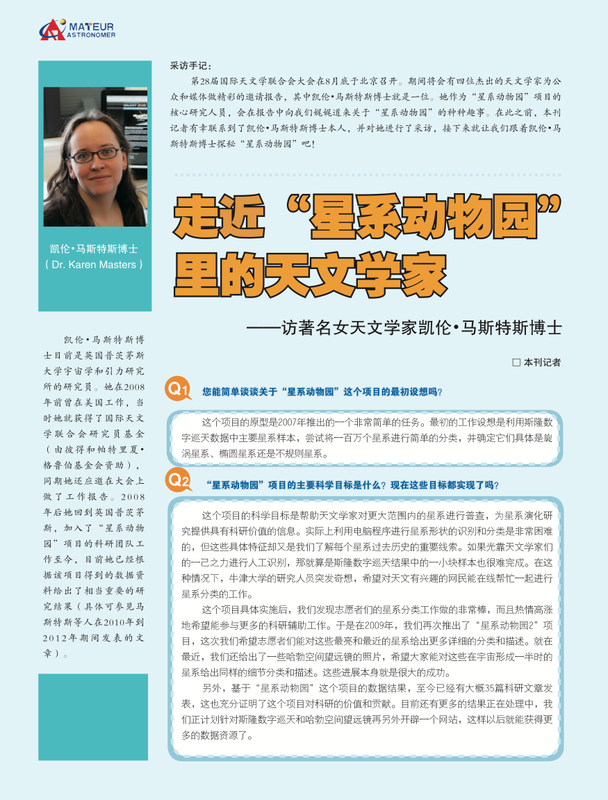 I also talked with someone from Southern Weekly (a Chinese newspaper with a readership of 8 million), who published this article (in Chinese). Finally I talked with people from China Radio International, who said they planned to run the story, but I’m not sure what came of that yet. They recorded me saying “Xin Xi Zong Dong Yuan” (our Chinese translation of “Galaxy Zoo”), and explaining (in English) what Galaxy Zoo is. Wow! That is fantastic Karen!! Xingxi Zong Dong Yuan (missing g in the blog post – sorry), is written on the title slide of the ppt I linked to in the first paragraph. Zong Dong Yuan means something like “join in and play/search”. “Finding Nemo” in Chinese was “Nemo Zong Dong Yuan”, so a Chinese collaborator at Portsmouth recommended this translation, instead of the literal “zoo” (as an animal park) translation – since in Chinese “zoo” doesn’t have the same multiple meanings we have in English. Interesting that both Amateur Astronomer and Southern Weekly chose a different translation. Hi, I asked a question after your talk, and you mentioned that the existence of a Chinese version of galaxy zoo will be quite helpful for the promotion of this project in China. I wrote an email immediately after the talk to the galaxy zoo group to volunteer a translation to a Chinese version, but until now, there is no mannual response. I’m afraid I have to put my question here, so how can I help to translate the website? Hi, I asked a question after your talk in Beijing. I remember you mentioned that there is no Chinese version of the Galaxy Zoo, and (I can’t agree more) it’s the major hinder for Chinese amateurs to help. Actually, some response of the news says that they would definately go to help if there is a Chinese version, and they are waiting for that. I wrote an email immediately after the talk to the galaxy zoo group for volunteering of the translation into Chinese, but until now there is no mannual response. So I have to put my question here, how can I help to translate this webpage into Chinese? Hi Yimingleon – sorry for the non response. 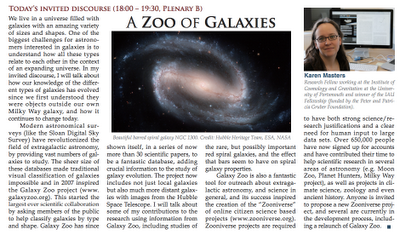 The Galaxy Zoo team email is often overwhelmed. Can you email me directly (karen.masters@port.ac.uk) and we’ll talk about what is required for a Chinese translation.